Palmiro Togliatti (Italian: [palˈmiːro toʎˈʎatti] listen (help·info); 26 March 1893 – 21 August 1964) was an Italian politician and leader of the Italian Communist Party from 1927 until his death. He was nicknamed by his supporters Il Migliore (The Best). His brother was the mathematician Eugenio Giuseppe Togliatti, discoverer of the Togliatti surfaces. Born in Genoa to a middle-class family, Togliatti began his political life in the Italian Socialist Party prior to the First World War. He served as a volunteer officer during the war, and was wounded in action and sent home for illness. Returning at the end of the conflict, he was a part of the group around Antonio Gramsci's L'Ordine Nuovo paper in Turin, while working as a tutor. He was a founding member of the Communist Party of Italy (PCd'I, later PCI) and, after Gramsci was jailed by Benito Mussolini's Fascist regime, he became the senior leader of the PCd'I until his death, for which he also directed Il Comunista. When the party was banned by the Italian Fascist government in 1926, Togliatti was one of few leaders not to be arrested, as he was attending a meeting of the Comintern in Moscow. In exile during the late 1920s and the 1930s, he organized clandestine meetings of the PCd'I at Lyon (1926) and Cologne (1931). In 1927 he took the position of Secretary of the party. In 1935, under the nom de guerre Ercole Ercoli, he was named member of the secretariat of the Comintern. In 1939 he was arrested in France: released, he moved to the Soviet Union and, remained there during World War II, broadcasting radio messages to Italy, in which he called for resistance to Nazi Germany and the Italian Social Republic. Togliatti speaks at the III. Congress of the Socialist Unity Party of Germany, 1950. In 1944 Togliatti returned to Italy, and led his PCI and other political forces to the so-called svolta di Salerno, the "Salerno Turn". This was a compromise between antifascist parties, the monarchy and prime minister Pietro Badoglio to set up a government of national unity and to postpone institutional questions. The PCI committed to supporting democracy and to abandon the armed struggle for the cause of Socialism. In effect, the turn moved the party to the right, in contrast with many demands from within; it also meant the disarmament of those members of the Italian resistance movement that had been organized by the PCI (the Garibaldi Brigades). Togliatti served from December 1944 as Deputy Prime Minister and then from June 1945 as Justice Minister. After having been minister without portfolio in the Pietro Badoglio government, he acted as vice-premier under Alcide De Gasperi in 1945. In opposition to the dominant line in his own party, he voted for the including of the Lateran Pacts in the Italian Constitution. At the 1946 general election, held at the same time as the Constitutional Referendum won by republic supporters, the PCI obtained 19% of the votes and 104 seats in the new Constituent Assembly. Communist ministers were evicted during the May 1947 crisis. The same month, Maurice Thorez, head of the French Communist Party (PCF), was forced to quit Paul Ramadier's government along with the four other communist ministers. As in Italy, the PCI was very strong, taking part in the Three parties alliance (Tripartisme) and scoring 28.6% at the November 1946 elections. In 1948, Togliatti led the PCI in the first democratic election after World War II. He lost to the Christian Democrat party (DC – Democrazia Cristiana) after a highly confrontational campaign in which the United States, viewing him as a Cold War enemy, played a large part. Allied with the PCI in the Popular Democratic Front, the left-wing achieved 31% of the votes. On 14 July 1948, Togliatti was shot three times, being severely wounded by Antonio Pallante, a strongly anti-communist student, with mental health problems; his life hung in the balance for days and news about his condition was uncertain, causing an acute political crisis in Italy (which included a general strike called by the Italian General Confederation of Labour). Carlo Lucarelli's Via delle oche, the final book in his De Luca trilogy, contains a vivid fictionalized account of that day. An official portrait of Togliatti in 1950s. Under his leadership, the PCI became the second largest party in Italy, and the largest non-ruling communist party in Europe. Although permanently in the opposition at the national level during Togliatti's lifetime, the party ran many municipalities and held great power at the local and regional level in certain areas. In 1953, he fought against the so-called "cheat or swindle law", an electoral legislation passed by the Christian Democracy-led majority of the time, which aimed at using first past the post to augment the center-right's power. Ultimately, the law was to prove of no use for the government in the elections of that year, where Togliatti's PCI won 22.6% of the vote. It was repealed in November 1953. Despite his allegedly close relationship with the Soviet Union, Togliatti's leadership remained unscathed after the 1956 Hungarian Revolution (which was in most countries a cause for major conflicts within the left). He developed and named the polycentrism theory (unity in diversity within the communist parties in all countries). In the 1958 elections, the number of Communist votes was still on the rise. In the 1963 elections, the PCI gained 25.2% of the votes, but again failed to reach a relative majority. Togliatti and Nilde Iotti, before 1964. Togliatti died as a result of cerebral haemorrhage  while vacationing with his companion Nilde Iotti in Yalta, then in the Soviet Union. According to some of his collaborators, Togliatti was travelling to the Soviet Union in order to give his support to Leonid Brezhnev's election as Nikita Khrushchev's successor at the head of Communist Party of the Soviet Union. His favourite pupil, Enrico Berlinguer, was later elected as his successor to the National Secretary of the PCI position, though Berlinguer's time in office saw the rejection of key policies advocated by Togliatti. The Russian city of Stavropol-on-Volga, where Togliatti had been instrumental in establishing the AutoVAZ (Lada) automobile manufacturing plant in collaboration with Fiat, was renamed Tolyatti (as transliterated from Тольятти, the Russian spelling of his name) in his honor in 1964, after his death. Agarossi and Zaslavsky (2011) argue that Togliatti and the other leaders of the PCI were fundamentally subservient to Stalin, and did their best to promote Soviet interests. They argue Togliatti was above all a Stalinist, and that he remained one for years after Stalin died in 1953 and the Soviet Union had repudiated much of his legacy. They argue that it was Stalin who ordered Togliatti to play a moderating role in Italian politics, because the time was not yet ripe for a showdown with capitalism. Agarossi and Zaslavsky rely not only on Togliatti's papers but those of the Kremlin, especially the highly detailed reports sent in by the Soviet ambassador in Rome. Stalin forced the PCI to reject and work against the Marshall Plan, despite the loss of much support from Italian voters who wanted the American aid. The Italian language eight volume collection of works, published by Editori Riuniti, Rome. Palmiro Togliatti Opere Vol. I, 1917–9926. Edited by Ernesto Ragionieri, 1967. Palmiro Togliatti Opere Vol. II, 1926–9929. Edited by Ernesto Ragionieri. Palmiro Togliatti Opere Vol. III, 1, 1929–9935. Edited by Ernesto Ragionieri, 1973. Palmiro Togliatti Opere Vol. III, 2, 1929–9935. Edited by Ernesto Ragionieri, 1973. Palmiro Togliatti Opere Vol. IV, 1, 1935–9944. Edited by Franco Andreucci & Paolo Spriano, 1979. Palmiro Togliatti Opere Vol. IV, 2, 1935–9944. Edited by Franco Andreucci & Paolo Spriano, 1979. Palmiro Togliatti Opere Vol. V, 1944–9955. Edited by Luciano Gruppi, 1984. ISBN 88-359-2736-6. Palmiro Togliatti Opere Vol. VI, 1956–9964. Edited by Luciano Gruppi, 1984. ISBN 88-359-2778-1. 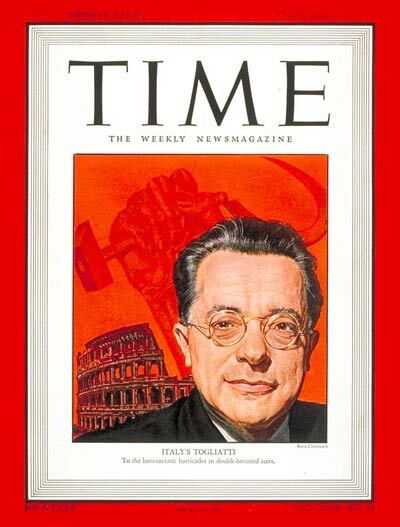 Togliatti on the cover of Time 5 May 1947. This page was last modified on 5 January 2016, at 20:30.